Chicago's Best Dining, Drinking, Cuisine & Cocktails | 312 Dining Diva: I Scream, You Scream . . .
Big Star: The Wicker Park whiskey honky tonk and taco joint's getting into the game this summer with a sort of food truck of its own. They're planning to serve a variety of soft serve right in front of the venue. TBA. David Burke's Primehouse: Each Friday in June (beginning this Friday), Executive Pastry Chef Jove Hubbard transforms J Bar into a pop-up ice-cream social. Each week, Jove will do a unique spin on childhood faves, such as Rocky Road with chocolate ice cream, beer marshmellows and smoked almonds. 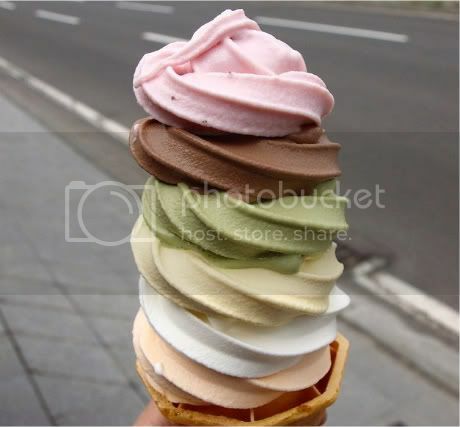 Jumbo cones are $5 a scoop; cash only. 3-5pm Fridays in June. Doughnut Vault: The doughy goodness at this tiny corner spot is irresistible, so can you imagine what the soft serve will be like?! Owner Brendan Sodikoff's planning to offer late-night frozen treats in the same flavors as his doughnuts. We're talking glazed, chocolate, old fashioned and cinnamon. YUM. TBA. M Burger: Both locations (River North, Streeterville) of the magnificent burger shop team up with Make-A-Wish Foundation of Illinois for the inaugural Dining For Wishes campaign. They're donating proceeds of the sale of a special Rainbow shake to the organization. Available in June for $2.99, beginning Saturday.